► 1. 【Portable to carry】The Humidifier\'s size is 55x55x54.5mm and its weight is 100g, which means that it is rather smaller and lighter than any other humidifiers so that you can easy to carry or put in your bag. ► 2. 【Fragrance】Marine flavor mixed with herbal, its smell is similiar with occean and cologne. It can alleviate anxiety and eliminate fatigue. Comes with 5 refill oceanic pads, each pad lasts for 2-4 weeks, especially in winter will be longer than other times. When its fragrance gone, you can refill with your favorite aroma oil by yourself. ► 3. 【Easy to use】Open the upper part of product, put a fragrant into the product and cover it, set it into the air vent of car. When you open the car air conditioner, you will smell the fragrance. ► 4. 【Materials】Made from stainless steel in good quality and glossy sliver colorway. ► 5. 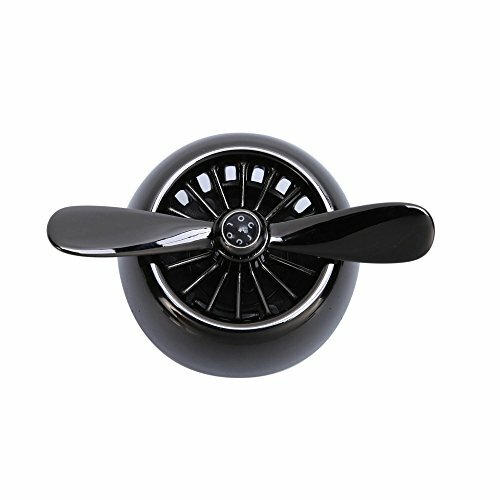 【Classic Design】Inspired by single turbine engine and propellerindustrial at the age of 1960s, it is in the full shape of turbine with the coordianation between retro and fashion. As for both cooling engine and artwork, it not only shows respect to craftsmanship, but also symbolizes the love of freedom in the 1960s.